Outdoor netball court surfaces are a very common sporting facility in the UK as the sport has recently become very popular due to high profile sporting events like the Olympics. Netball can be played on numerous types of surfaces and these can include synthetic all weather artificial grass, EPDM polymeric rubber crumb / tartan surfacing and asphalt tar macadam. Each of these surfaces can be designed and tailored to suit the individual specifications and requirements of each project and the sports which will be played on the multi sport facility. Fill in our contact form to get more information on the products and services we offer. One of our experts will get back to you to discuss the prices and offer you some product sheets if required. These types of sports surfaces can also house activities like basketball, football and hockey and they can be classed as true MUGA / ball court flooring. These surfaces can be classed as hard wearing and multipurpose and are perfect for facilities like clubs, parks, playgrounds and schools. Netball can have standard dimensions of 30.5m x 15.25m but they can be adapted and changed to suit all area sizes, dimensions and budget requirements of the client. The most popular surface specification for this type of facility would be porous macadam flooring, this provides excellent ball bounce capabilities to improve the performance characteristics and give a good playing experience for the players. These surfaces are often called MUGAs or multi use games areas and many thousands of these systems are installed in the UK. MUGA netball sports courts are designed to be porous and hard wearing systems that are fully durable and suitable for multi sports including netball and tennis. The permeability of these outdoor netball courts means that water can easily drain through the surface, preventing flooding and waterlogging which can damage the surface and make it unsafe for players. If you’d like to find out more about multipurpose games areas, please visit this page or contact us for further details. These facilities are extremely popular for schools and clubs who want to play multiple games on the same area. Feel free to complete our enquiry form if you would like to speak to an expert about installing and maintaining these facilities. We are a true one stop shop company / contractor and we have helped to design, specify and construct many outdoor netball courts. We can help you with all aspects of your project and this can include quotations, prices, costs, designs and budget information, as well as maintenance for your artificial sports surface to keep it in top condition. Our team can answer any questions you have about cleaning and repairs for sports facilities, as well as construction for brand new courts. 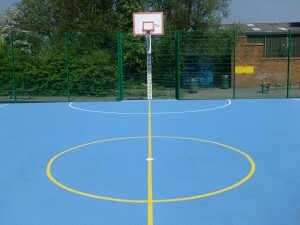 Please visit https://www.sportsandsafetysurfaces.co.uk/ for more information about the products and services we can offer you, and to see case study examples and photos of our previous work. If you would like to discuss and enquiry for sports or play surfacing, please don’t hesitate to speak with us through the contact form and we will get back to you with information regarding specifications and quotes. What activities would you choose to play on a multi use games area? Let us know what you think in the comments and remember to share this post if you enjoyed it! « How Much To Build an Athletics Long Jump Pit?